If you follow us on Twitter, you might’ve noticed our recent polls. Well, we want to hear more from you, so we’re making this a new weekly feature: The weekly Fan Feedback poll! We want input from you to help us shape our priorities, direction and rewards. Make sure your voice is heard! Last week, having just successfully completed our first giveaway, we wanted to know what you thought of our prizes (and what we should consider for future contests). 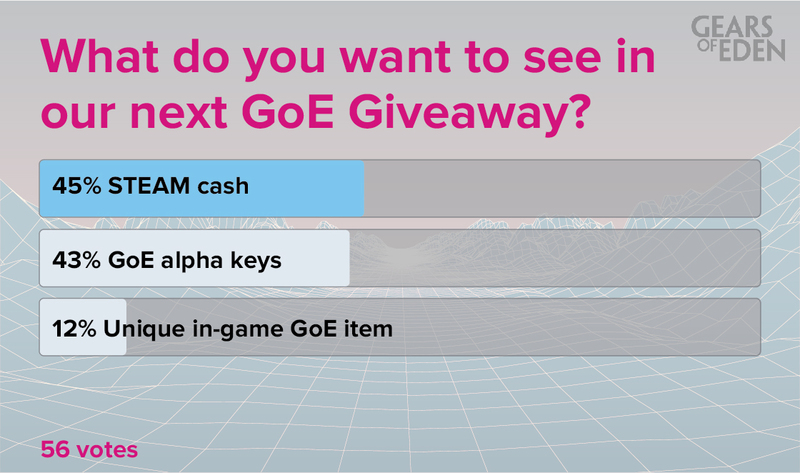 Big shocker, money won the poll, followed very closely by free keys for our alpha! We also had some fan feedback suggesting we do these giveaways more frequently with smaller prizes. We were thrilled with all of this feedback. I think that it’s safe to say, you’ll be seeing these poll results reflected in future giveaways, so keep an eye out! In this week’s poll, we want to know what feature you are most excited for in Gears of Eden! Story and Characters have the early lead, but there’s still a whole week for ballot casting! Let us know your favorite here, and then continue to follow us to find out how your opinion stacks up against the rest of our voting fans!